Your child’s health records will now be made available at a click of a button. India’s first ever digital platform, Integrated Child Health Record (ICHR), to keep a child’s health record,has been launched today. Supported by cloud computing and mobile technology, ICHR is a revolutionary product to map a child’s health and track vaccination. ICHR is supported by first-of-its-kind mobile application to address pressing concern of parents willing to track their child’s growth and vaccination. The mobile interface will be available for both android and iOS users. The eminent scientist Samir K Brahmachari was also present as chief guest to launch and endorse ICHR. Speaking on the occasion Prof. Brahmachari – J.C Bose National Fellow, Founder Director, CSIR- Institute of Genomics & Integrative Biology, Former Director General, Council of Scientific & Industrial Research, said; I am happy to announce/endorse product in ICT domain by young entrepreneur with high social value, which is aligned to Government of India’s digital vision. ICHR provides and automates long-term surveillance of a child’s growth. It has other benefits like it will also help in early detection of obesity and malnutrition in urban and rural population respectively. It also addresses the dire need of maintaining the data centrally for research purposes. Once fully implemented, ICHR will become a potent tool in providing authentic region specific data for analysing and identifying reasons and probable solutions for both child vaccination and growth related issues. Commenting on the merits of ICHR, Dr. Raghuram Mallaiah, Director Neonatologist, Fortis Le Femme, said, “This application is all about empowering parents regarding their child vaccination and growth. This application removes the manual vaccination cards and makes the experience paperless and traceable from any part of the world. This is the only app available in India to track the growth of premature babies both in the hospital and once they have been discharged from the hospital. This will be particularly beneficial for both doctors and parents to track the growth parameters of premature babies (Fenton Chart), not only while they are in hospital but even after their discharge up to 5 years (only app which continues from Fenton chart to the WHO chart).”He further explained that the application can be used in both urban and rural areas to track growth parametrs in children upto 5 years and help in early detection of obesity (increasing trend of obesity as per WHO guidelines) And malnutrition. This will also help in much needed collection of data across India with regards to vaccination uptake. WHO data indicates that we have 235 million Children 0-9 years out of our total population of 1.25 Billion with physicians density of 6.49 physicians per 10000 population. We witness 7 lacs neonatal deaths every year and almost 3 lacs of such cases are because of lack of vaccinations. These kids died due to Diarrhoea and Pneumonia making India rank as Third Lowest among 15 other high burden countries across the globe forits Global Action Plan for Pneumonia and Diarrhoea. Once fully implemented, ICHR will come handy in providing authentic region specific data for analyzing and identifying reasons and probable solutions for such problems. 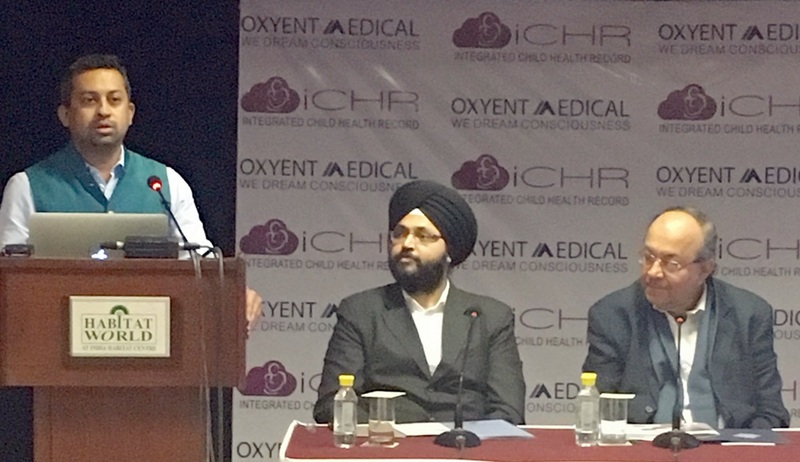 Harpreet Singh, Chief Technology Officer, Oxyent Medical, the company behind ICHR said, “Our main aim behind this product is to provide a paperless authenticated platform integrating doctors, hospitals and parents.The platform will provide automated vaccination record and will monitor the growth schedule. Additionally, the technology is secure and HIPAA compliant. It is a cloud-based solution, which can be easily linked to hospital HIS/EMR system via HL7 or integration adaptors. There is no physical software installation needed to start using iCHR. Being on Amazon cloud, doctor can access real time patient information regarding growth & vaccination from any part of world using Internet.